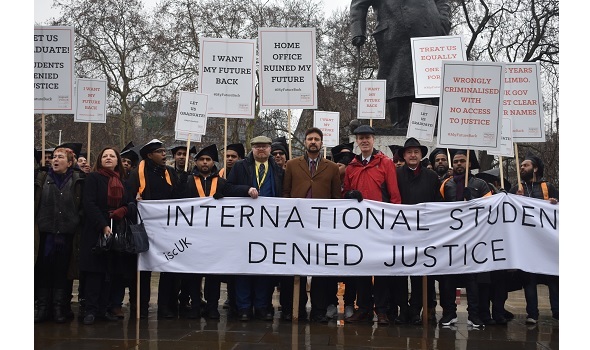 On a wet and freezing cold January day, we and dozens of international students who were wrongly accused of cheating by the Home Office in 2014 took their call for justice to Westminster. Standing in Parliament Square Gardens, across the road from the House of Commons where the politicians who threw their lives into chaos spend their days, they waved placards and called for urgent action to right the wrong. "We want justice, we want justice!" they chanted as one. "I want my future back, I want my future back!" They wore the graduation gowns and caps they were denied when the Home Office took all their rights from them, including the right to study. Film crews from BBC London News, ITV London News and London Live filmed the protest and spoke with some of the students there. Ahead of the event, Huffington Post and The Canary reported on the scandal. The Daily Star - the biggest English-language newspaper in Bangladesh - also reported on the issue and the demo. MPs including Stephen Timms, who has advocated for the students for several years, Martyn Day, Afzal Khan and Jim Fitzpatrick came to show their support. After the demo, the students went inside the Houses of Parliament for a meeting to discuss the impact of the allegations on their lives and the campaign's next steps. A number of MPs, including Stephen Timms, Alan Whitehead and Hilary Benn, spoke at the event and expressed their anger at the injustice and determination to reach a solution. It's now been five years since the first allegations of cheating on an English test known as TOEIC and thousands of students wrongly accused have been living in limbo ever since - not allowed to work, study, rent a house or drive a car, and spending all they have on hopeless court battles in a desperate bid to clear their names. Last July, we published a damning report into this Home Office debacle. In September, it was debated in Parliament. But the government has still not taken action. Lives have been ruined, families torn apart, futures lost. In most cases, the government has failed to present any evidence at all to back up their allegations of cheating. Where there is evidence, it’s often spectacularly flawed. Yet with no in-country appeal right, many of the students had no way of fighting the allegations. Due process has been trampled and the founding tenet of the UK justice system – “innocent until proven guilty” – overturned. Please sign the petition calling for justice here. And to donate to this campaign, visit our fundraising page here.